Last Friday July 29, 2016 was National Chicken Wing Day! As some of you may remember I participate with several Big Green “Eggsperts” cooking and writing for another blog: Big Green Brotherhood. To celebrate this great food holiday, we were eager to cook our favorite chicken wing recipes last weekend and share them with you. This post features one of my all time favorite recipes for chicken wings; I hope you enjoy this as much as I do. Now sit back, grab an ice cold Singha, and enjoy this post for Honey Sriracha Chicken Wings. I use a stick of butter, 2/3 cup of sriracha, 1/2 cup of honey, 1 Tbls. of sesame oil, and lime juice for my glaze. Put all of those ingredients in a saucepan and melted over medium heat stirring occasionally; once combined, turn the heat off and let the sauce cool a little. Set the Big Green Egg up for indirect cooking at 300° using 2-3 hickory wood chunks. I placed the wings in the BGE and let them cook (turning once) until they hit 165°. This cook took me 45 minutes to get there. Unfortunately, I was not able to get any further cooking shots yesterday as it started to pour down rain! So, I will describe the process I used to get the final dish shown below. After the 45 minutes I pulled the wings and submerged them in to the Honey Sriracha glaze. I set the Big Green Egg for direct grilling and cranked the heat to 500°. I placed the wings back on and cooked them for 5 minutes turning occasionally. I served the wings with fresh cilantro and chopped coconut almonds. Delicious!!! 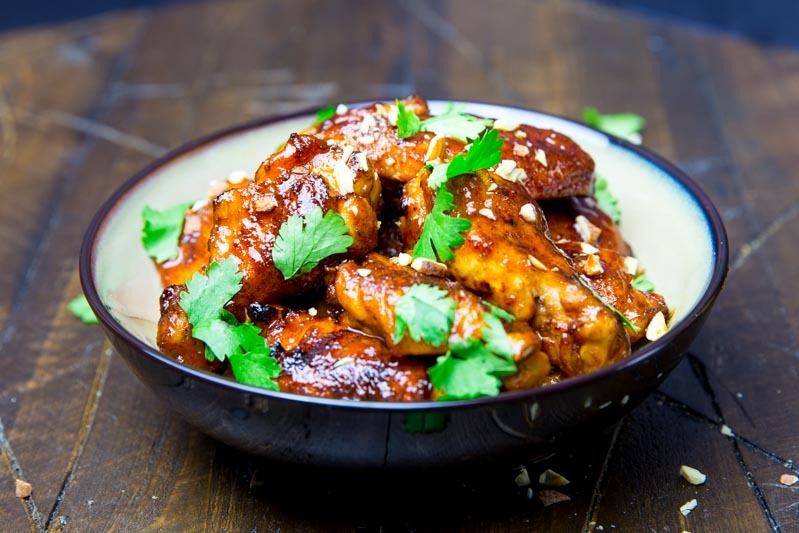 This recipe for honey sriracha chicken wings is fantastic. The perfect balance between heat and sweat this recipe is sure to please.